There are various types of mole present in the hand.Some has small in size and some has large in size.like that there are different color of mole found in the hand like white,black ,red,brown etc.Some of these mole can disappear from the hand after giving results and some these mole can give permanent results.These have different location on hand and they give result according to there location on hand . Black Mole: if black mole present inside palm then it gives good results.This indicate person has lot of income but he has not able to save money. 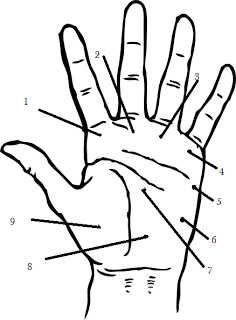 According to given figure you can easily find out the significance of mole on palm. 1. Mount of Jupiter—If black mole is present on mount of Jupiter it can create difficulty in getting married or in married life. it can create difficulty in desired success. 2. Mount of Saturn—If black mole is present on mount of Saturn then Luck may not favors. Person may commit suicide. 4. Mount of Mercury-If black mole is present on mount of Mercury person will be Restless. Cheater.person will face problems in married life and with children. 5. Mount of Mars—If black mole is present on mount of Mars then it can create head injury.person will be Coward. and Suicidal tendencies. 6. Mount of Moon— If black mole is present on mount of Moon then Late marriage, sinus and mental issues. 8. Mount of Ketu—If black mole is present on mount of Ketu it can create Illnesses in childhood or troublesome childhood. 9. Mount of Venus—If black mole is present on mount of venus then it can create Sexual diseases and other venus related problems.